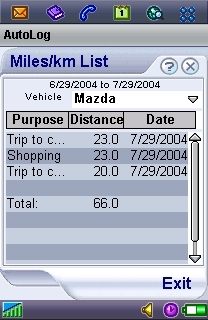 AutoLog for SE P800/P900 is a quick and easy way to track tax-deductible auto mileage and expenses. Auto Log allows you to compare the benefits of the two types of tax deductions for business automobile expense: mileage reimbursement and expense/depreciation itemization (note: see your financial advisor for details). Auto Log fulfills IRS requirements for contemporaneous expense and mileage tracking, along with Purpose and Notes fields to help substantiate your deductions. The Summary page provides detailed info and totals by user selected date and expense type for easy transcription of data into your tax files. Export to a CSV file for easy sync to the desktops from the filtered AutoLog Summary screen. Then load your info into Word, Excel, or any other application! Auto Log allows you to create any number of user-defined expense types. You can track expenses for an unlimited number of vehicles. Auto Log supports both color and gray-scale devices. L3's Image Calendars blend a useful calendar / clock display with a dazzling image slideshow!